The two large ticks are the American dog tick (left) and the lone star tick (right_. The small tick is the black-legged tick. The Washington-metropolitan region continues its woes with tick borne illnesses this year. Last spring the Washington Post reported figures from the Centers for Disease Control indicating that between 2006 and 2007 the cases of Lyme disease in our region more than doubled. This fact hit close to home when several people in my immediate circle of family and friends contracted Lyme disease during the past year. My intrepid band of tick-collectors harvested an impressive bounty of ticks during the month of May and early June. While most were lone star ticks, I did receive several American dog ticks and two black-legged ticks, a.k.a. deer ticks. 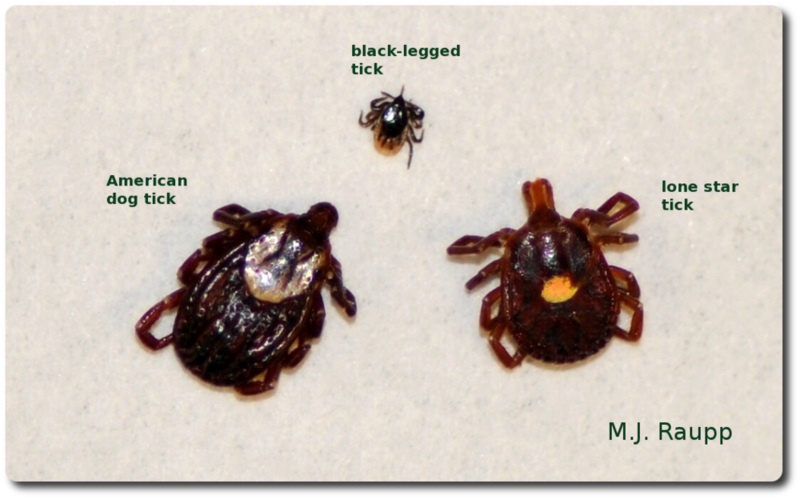 The black-legged tick, Ixodes scapularis, is an important carrier of Lyme disease in our area while on the west coast the western black-legged tick, Ixodes pacificus, is the culprit. A bull's eye rash is one of the characteristic symptoms of Lyme disease. Lyme disease can be a serious debilitating disease. In the short-term flu-like symptoms including headache, fever, fatigue, and an unmistakable bulls-eye rash called erythema migrans usually accompany a case of Lyme disease. An untreated infection becomes more serious when the bacterium moves to joints, the heart, and the nervous system. The culprit behind Lyme disease is a bacterium called Borrelia burgdorferi. Borrelia is transmitted by ticks from mammals like mice to humans. The northeastern region of our country is a hotbed for black-legged ticks and often leads the nation in the annual number of cases of Lyme disease. The number of Lyme disease cases rises dramatically in May and June, peaks in July and August, and declines in autumn. However, in many parts of the country, ticks are active even on warm days in winter and Lyme disease is a year-round threat. Why are there so many ticks this year? One fascinating study suggests that as populations of small mammals like white-footed mice and chipmunks increase, tick populations also increase, thereby elevating the risk of tick bites and the potential for Lyme disease in humans. Greater abundance of small mammals like mice and chipmunks follow years in which oak trees produce bumper crops of acorns in a phenomenon called masting. White-tailed deer are frequently implicated with ticks and Lyme disease; however, researchers found deer to be less important contributors to the risk of Lyme disease than populations of small mammals. When it comes to Lyme disease, blame the mighty mouse and the mighty oak more than Bambi. The second tick in my trio of trouble is the American dog tick. American dog tick and its cousin, Rocky Mountain wood tick, are the vectors of another serious disease called Rocky Mountain spotted fever. Although it is less common than Lyme disease, it is potentially life threatening. Contrary to the implication of its name, Rocky Mountain spotted fever is common east of the Rockies in states lining the Mississippi and in the Carolinas. Cases of Rocky Mountain spotted fever are relatively rare compared to those of Lyme disease. Cases of Lyme disease averaged more than 20,000 for the last several years while usually fewer than 1,000 cases of Rocky Mountain spotted fever occur annually in the US. The third and most common tick I bumped into this spring is the lone star tick. Lone star tick transmits several illnesses including one known as Southern Tick Associated Rash Illness (STARI). Symptoms of STARI include a rash, fever, fatigue, and pain in muscles and joints. A second disease spread by the lone star tick is ehrlichiosis. This bacterium produces nasty flu-like symptoms including headache, joint ache, fever, fatigue, muscle ache, confusion, and several other disheartening symptoms. Recently, a friend living near Charlottesville contracted ehrlichiosis and shared that it was the most unpleasant illness she ever experienced. Yikes! Chronic arthritis and neurological problems have not been linked to this disease as they have to Lyme disease. Ticks are best removed with forceps. To reduce the risks of becoming a meal for a tick and the unfortunate recipient of Lyme disease, Rocky Mountain spotted fever, STARI, or ehrlichiosis remember the word “AIR”. This stands for avoid, inspect, and remove. Avoid ticks and their bites in the following ways. If you enter habitats where wildlife and ticks are suspected such as grassy meadows, borders of fields and woodlands, and vegetation along the banks of streams, wear long pants and light colored clothing. This will help you spot ticks on your clothes as they move up your body. Tuck your pant legs into your socks. This forces ticks to move up and over your cloths rather than under them where tasty skin awaits. 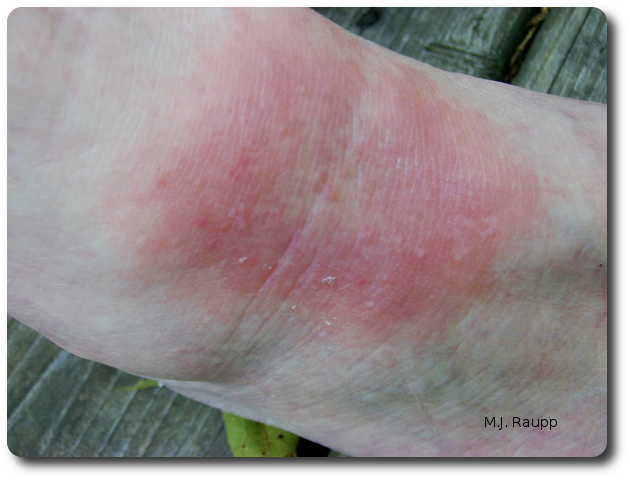 Apply repellents labeled for use against ticks. Some are applied directly to skin, but others can only be applied to clothing. If repellents are used, be sure to read the label, follow directions carefully, and heed precautions, particularly those related to children. Inspect yourself and your family thoroughly if you have been in tick habitats. This may involve enlisting a helper to view those "hard to see" areas around back. Remove ticks promptly if you find them. Removal within the first 24 hours can greatly decrease your risk of contracting a disease. If you find a tick attached, firmly grasp the tick as close to your skin as possible using a pair of fine forceps and slowly, steadily pull the tick out. Cleanse the area with antiseptic. The CDC and the Bug-Guy do not recommend methods of tick removal such as smearing the tick with petroleum jelly or scorching its rear end with a match. Cases of Lyme disease are the most common in children and seniors, so take special care to keep kids of all ages safe when they play outdoors. Special thanks to my tick wranglers Chris, Joe, Ryan, Al, Erik, and Christina and to Kim and Sheri who shared their tales and images of Lyme disease and were the inspiration for this episode. The great article “Climate, Deer, Rodents, and Acorns as Determinants of Variation in Lyme-Disease Risk” by Richard S Ostfeld, Charles D Canham, Kelly Oggenfuss, Raymond J Winchcombe, and Felicia Keesing and the following web sites were used as sources for this episode.